Whichever battery selection you make, the design is essentially the same. 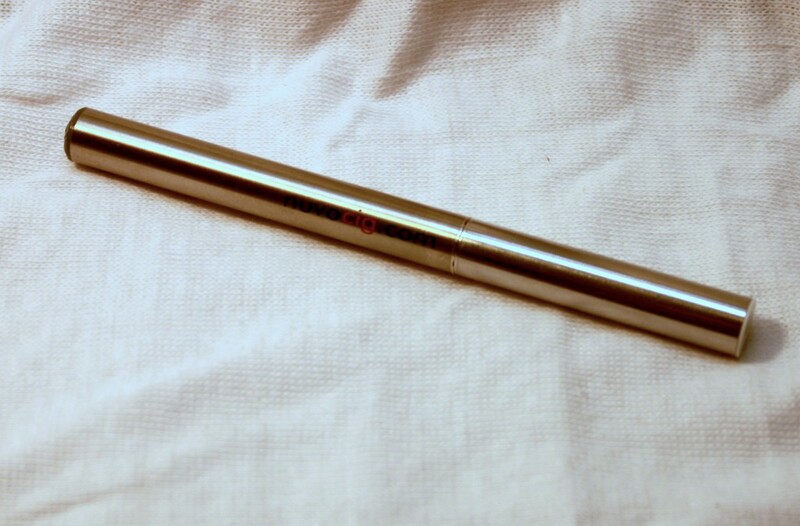 Both types are constructed of aluminum with a brushed aluminum finish. The automatic battery features a sort of dark orange LED at the tip, while the eGo button on the big battery glows blue. Each battery is emblazoned with a two-color nuvocig.com brand on them. In what’s a nice touch, the cartomizers feature the same sleek silver finish, save for a white cap on the end of the cartomizer. I find this to be a welcome departure from other e-cigarettes that have really nicely done batteries and then uninspired cartomizers. Most are paper-wrapped affairs with generic colors or even worse, those funky looking cigarette filter patterns. Speaking of cartomizers, these are of the variety with hard plastic caps on the end, so refilling would be somewhat difficult. This company does not sell refill e-liquid, so they pretty much expect you’ll buy replacement cartridges for a fairly steep $19.99 per 5-pack. Pricing does go down for multiple pack purchases, but it’s definitely on the high side of the price scale. Don’t think if you opt for the big battery, you’ll escape the need to buy refill cartridges. Unlike many companies with eGo battery offerings, they don’t have any kind of tanks for sale. 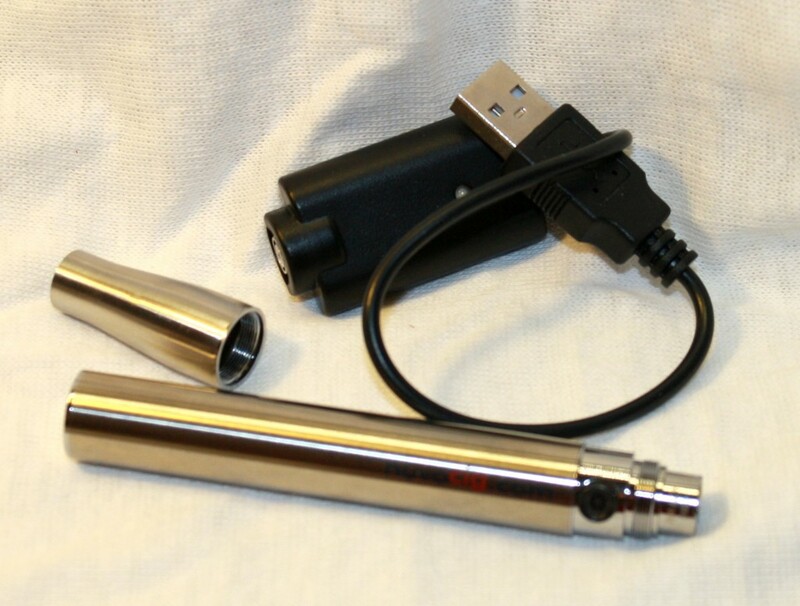 The Big Battery simply includes an adapter cone to fit over the existing cartomizers. It’s kind of old-school chic. This is how we vaped back in my day, kids. Fortunately, these are 510 threaded, so you don’t really have to worry about lock-in with these kits as that’s easily the most popular e-cigarette standard on the market. As an aside, if you check out the accessories section, you can find additional battery styles, including a 4.2 v high-performance battery, as well as other LED options and even white batteries. At least with the standardization on traditional cartomizers, it makes filling easy… You don’t actually fill these. I got several flavors in my review sample including some fruit flavors and the traditional tobacco. The tobacco was a fairly interesting tobacco flavor, it tasted more like a pipe tobacco than a (generally terrible) fake cigarette flavor common in most standard kits. The fruit flavors were fairly simple, but not unpleasant in any way. The cartomizers dialed in at around 2.5 ohms for resistance. This means when coupled with the fairly weak standard battery vapor wasn’t anything to write home about. It was OK, but certainly not the best I’ve seen in a traditional e-cigarette. Switching over to the Big Battery was a much different story. Those are regulated at 4 volts, much more powerful than the automatic batteries. Vapor production was quite good when provided the extra power in the larger batteries. I also strapped the big battery to an Aro Tank and was not disappointed with the performance there either. The Big Battery is good stuff. It’s also rated at 1000mAh of capacity so that means most users will get plenty of run time out of the battery. If I had to pick between the offerings, I’d suggest going with the larger battery based on the performance and compatibility with third party tanks. Nuvo Cig offers some really sleek looking e-cigarette starter kits. The traditional automatic battery version is a little on the anemic side, but the Big Battery setup produces some nice vapor. Nuvo has kits starting at 14.95, but most kits tend to be on the higher end of the price spectrum. All batteries are 510 threaded so are compatible with a wide range of aftermarket accessories. You can check out the kit offerings and pricing at Nuvo’s site. 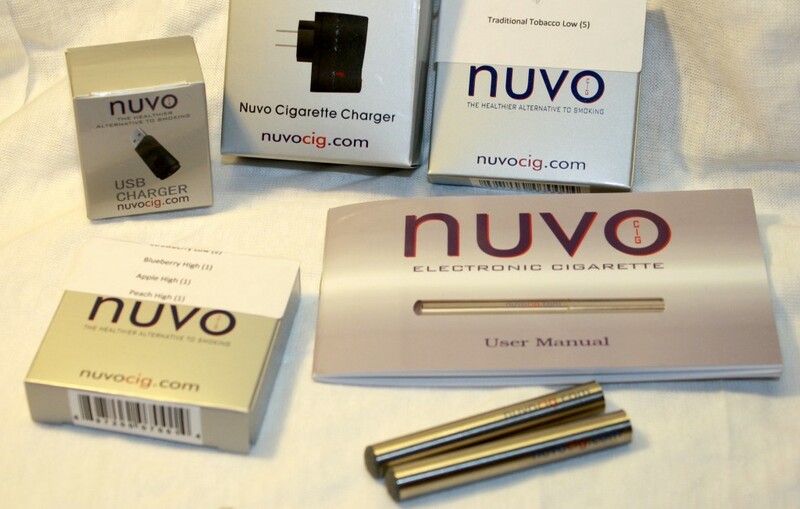 Disclosure: I received this kit from Nuvo Cig for review. I have added affiliate links after the review was written and published.